The last time I wrote on here was about two months ago. 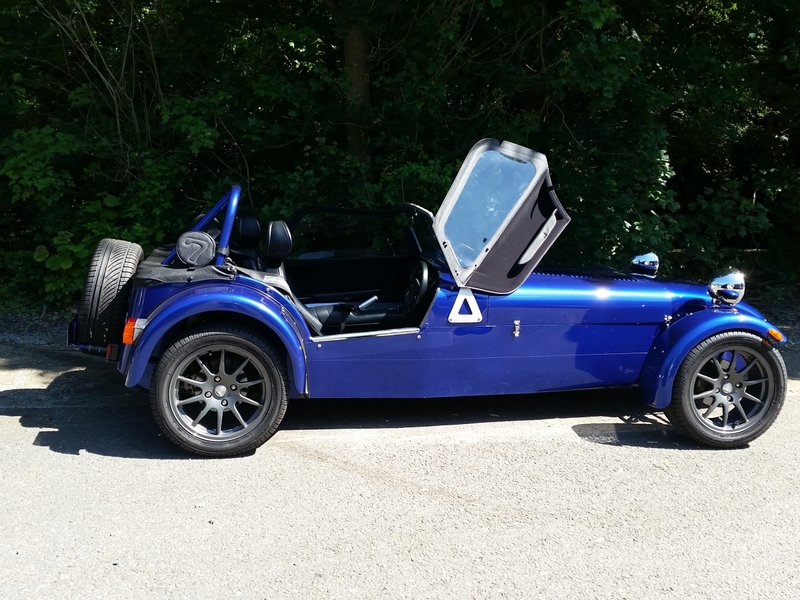 That is the length of my experience with a Caterham Seven so I thought it might be entertaining to share what I’ve discovered about Seven ownership from the perspective of a complete novice and by way of a journey home. When I say entertaining I probably mean “boring” but there’s an outside chance that veterans might find an opportunity to point and laugh at me and prospective owners might find solace in the fact that they’re not the only ones without a single solitary clue. When I sacrificed a new kitchen for my Seven it really was a leap into the dark and, rumour has it, a bit of an impulse purchase. Sure I’d coveted a Caterham. Sure I’d seen them from a distance … briefly … and sure I knew that some bloke called Colin once had one but that was about it. My experience in control of one extended to a five minute test drive and I would soon have to pick my car up and drive it home around the M25 motorway. The day before picking the car up was spent in mild preparation on YouTube where I tried to gain some insight into what my journey back home might be like (65 miles). Many videos about something called the Caterham Academy popped up. It all sounded very educational so I dove straight in. Horror crash after horror crash had me opening a bottle of wine. The next morning was a blur of nervousness and self-doubt from which I awoke standing beside an Azure Blue 140SV 6 Speed LSD with keys in hand and heart in mouth. Newbie Fact: Getting into a Caterham requires presence of mind and a clear well-rehearsed order in which things should be done. There is no point strapping yourself into your harness unless the keys are in the ignition, the side door is secured and the detachable steering wheel is in place. A number of very nice people didn’t laugh at me. Engine running, first gear, pull away and I was off. But if I can be serious for a moment. These things are loud, and I’m not just talking about engine noise. I can hear the differential, the road, the clanging and the clattering of that thing, the burble from the exhaust, the rattle from that other thing. The distinct impression was one of an imminent complete system failure. Newbie Fact: Caterhams make all kinds of weird noises. Yours is not the only one. You haven’t somehow accidentally bought the Lego kit. Minor roads, bigger roads, Dartford Tunnel (ON PURPOSE NOISE! ), M25. Then a weird sort of comforting comparative silence. I hit the slow lane and poodled at 60mph. This soon changed after I decided it would be better to be ahead of the BIGGEST LORRIES IN THE WORLD rather than be overtaken by them …. slowly …. while looking at the fine detail in the tread of their tyres … their massive, heavily laden tyres. Newbie Fact: (Disclaimer: my experience only) Other road users will either love your Caterham or hate it. Lorry drivers are nervous around you because their wing mirrors don’t have the resolution to resolve down to a Caterham. Van drivers have taken it personally that you have a neat car. Kids in the back seat of their parent’s car think you are a God. Bikers will buzz you just to take a look. BMW drivers will try to race you and then pretend they weren’t really trying anyway. Other Caterham drivers will wave at you like excited schoolgirls. You will do the same. The journey on the M25 was not as bad as I expected. There’s a sort of vulnerability mixed with a feeling of invincibility when in a Caterham. It’s a very odd combination that stayed with me after I left the motorway and joined the A and B roads. Then I was on the home straight and back into my village, past the local pub (wave), left into my road and down the slope to my garage. What an utter revelation driving a Caterham is. I used to ride a motorbike, briefly. That was the only time I felt a similar feeling. Utterly connected and involved. Once out of the car the world felt like it had slowed down while I was like some kind of jacked up wasp. Newbie Fact: When you get back into your normal daily road car it will feel like a bag of sponges. This is normal. The feeling will pass. It struck me, standing outside my garage next to a burbling sports car, that I own a Caterham. What struck me even harder was that I have a very small garage and that I had not taken any measurements before deciding to own a Series 5 chassis car. Newbie Fact: It’ll fit. Don’t sweat it. But don’t be an Uber-Noob. Measure it. Since then I have commuted to work in the Seven at every opportunity. I bought the car at the perfect time … the hottest summer since 1976 and in two months I’ve put about 650 miles on the clock. Newbie Fact: When your oil pressure suddenly drops into the red it’s probably the electrical oil pressure sender which, I believe, were sourced from the actual Caterham Lego kit. Have it replaced with a mechanical oil pressure gauge. “Engine oil levels. These cannot be checked too often”. It seems to me that checking the engine oil level in the Caterham is exquisitely tricky. The company must have put together some of its best minds to come up with such a testing regime. I have a 1.8 K series wet sump engine. The advice from Caterham is that the engine needs to be RUNNING and up to temperature before checking the oil. The dip stick is hard to read and way too similar a colour to that of engine oil. The difference between full and not very full is not that much oil at all. I’m sure I’ll get the hang of it but honestly … if engine oil levels “cannot be checked too often” then surely there must be a better way. You know, one where two consecutive readings return the same result? Mind you, if I wanted normality, I would have bought a kitchen. So many of things you've mentioned I experienced since collecting my car last September and driving nearly 300 miles home from Crawley. Ownership does seem to come with a variety of emotions, most of which can occur at the same time. I'm still not sure what to make of my car, the only thing I do know is that I'm strangely drawn to it for some bizarre illogical reason! Although I’ve had a few Caterhams in the distant past, this prepares me for what’s ahead. Some great reminders in there!